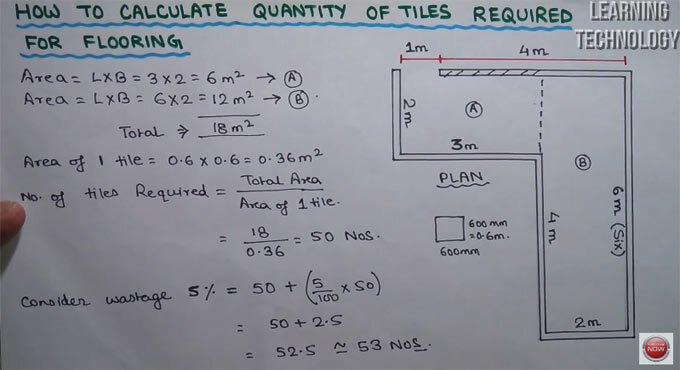 In this construction video tutorial, you will learn how to compute quantity of tiles required in building rooms or bathrooms. Initially, you have to determine the area of the room where the tiles will be placed. Suppose, there is an L-shaped room and it is divided as part A and part B. But, you have to also consider the wastage that may occur in construction site. The wastage differs from site to site as well as according to room sizes. Assume, standard wastage is 5%. To get more clear idea, go through the following video tutorial.